Good morning out there, and happy Found Art Friday! 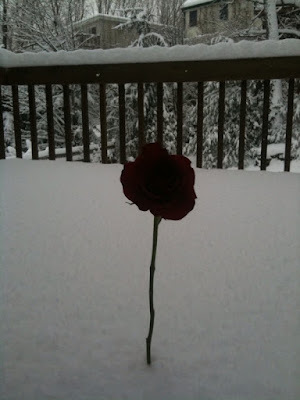 Our theme this month is -- quite inappropriately with all of this snow and freezing weather -- "Everything Blooming." So I'd like to send out an extra big thank you to all of our contributers for digging deeply into their memories of lost warm, springlike days to create these beautiful bouquets. 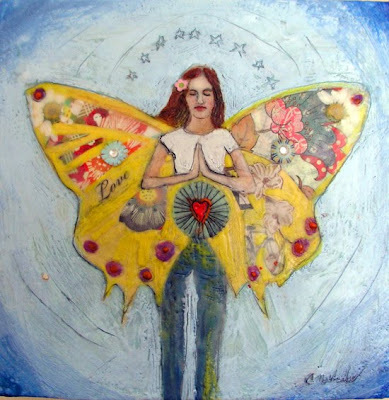 "Rebirth" -- Encaustic & Mixed Media on Wood Panel (flowers are blooming in her wings!) By Cathy Nichols. 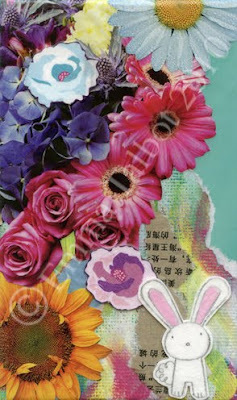 "Everything Blooming" by Claire Ishino. "Spring is in the Air" By Megan Woodard Johnson. "Just Under the Surface" by Heather Kirtland. "Tokyo Bunny" by Emma Talbot. 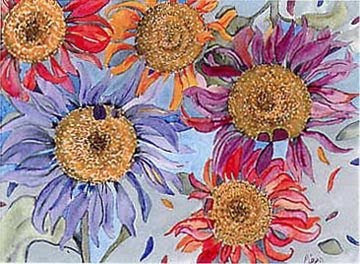 "Everything Blooming" by Tara Leaver. Thank you, again to everyone who participated this month in our little Found Art Friday experiment. For next month's theme, I thought I would up the "randomness quotient" by asking everyone to suggest a theme here in the comments, and I will pick one of the themes out of a hat for March! So please suggest something, and be creative. All theme ideas are welcome. This Friday is Found Art Friday! 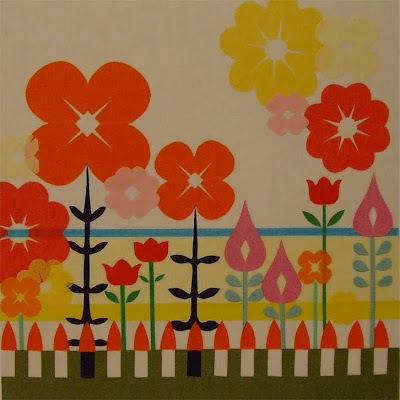 The end of the month is almost upon us, and this Friday's Found Art theme is "Everything Blooming." I know, I know... it's very hard to imagine blooms when this has been such a long, cold winter. But perhaps if we all think spring hard enough, a thaw will come. 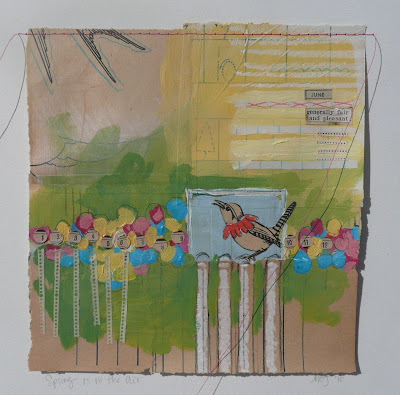 If you're new to Found Art Friday, the idea is to just create freely and without much planning... seeing what fun, serendipitous idea comes to mind. If you plan to participate, just post your submission to your blog & email me a link to it at cnichols19@aim.com. If you don't have a blog, just email me a jpeg image. 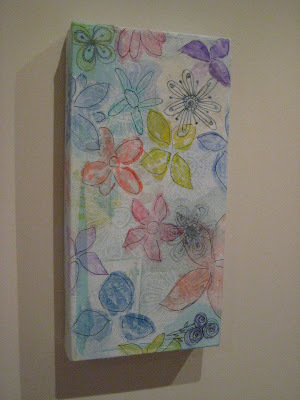 And speaking of "Everything Blooming," I stumbled upon this image of my very first painting today. It's called "Night Garden," and it so reminded me of our theme this week, so I thought I would share. "Night Garden" 20x28 inches -- acrylic on canvas. 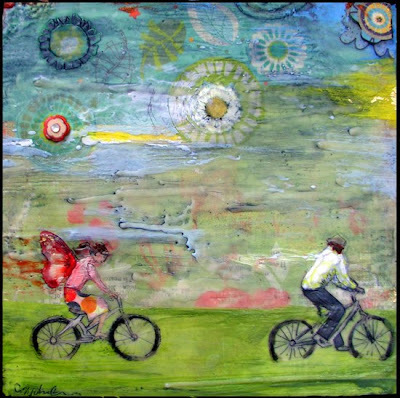 "Wings of Desire" - 10x10 mixed media encaustic painting on cradled wood panel. "Wings of Desire" on the wall. This is my newest painting, and the original will be going to a show this April. I'm not sure which show it will be sent off to yet, so it's still a secret. :) But I do love this piece. My favorite part of this piece was the last minute idea to turn the painting sideways and drip wax across the panel for the illusion of speed & motion. Courtney P. asked in a comment recently if I would ever go back to acrylic... and I think yes, but not for a while! It's too cool to see what surprises the drips and splatters can inspire. 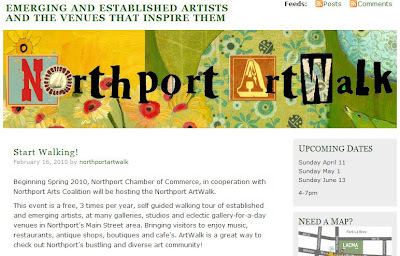 The Northport ArtWalk is a new cultural event here in our charming village of Northport, NY. And, I'm very proud to have created the logo! This was a particularly cool project for me because I grew up in the area and moved back here recently after many years in Los Angeles -- where I looked forward to the amazing Venice Artwalk with a mixture of suspense and unbridled awe. When I left home at 18, I never dreamed that I would get to create a logo design for an Artwalk right here in Northport. This is such an adorable village -- nestled right next to the harbor and filled with quaint shops and sweet architecture -- it truly is a spot ripe for artistic revival, and I hope that the new ArtWalk will unite the artistic community and bring fresh creative energy to the town. A big thank you to Lisa Harris for giving me this opportunity. If you live in or around Northport, please visit the ArtWalk website for more information (and artists, there is a link for information about participating). 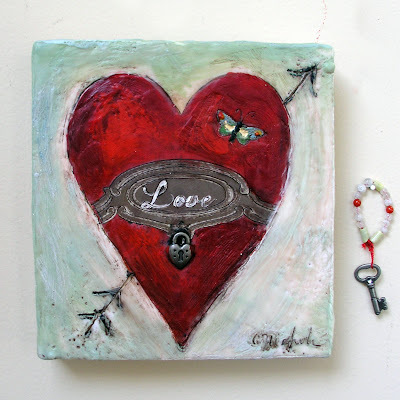 "My Heart is Yours" original encaustic painting on wood support -- with key charm! Yes, it's my first experiment with a jewlery addition to my painting! I saw this little set of lock & key charms at the craft store last week, and thought: "wouldn't it be cool to create a valentine painting with these?" And here is the result. It's definitely a very romantic gift for someone special. 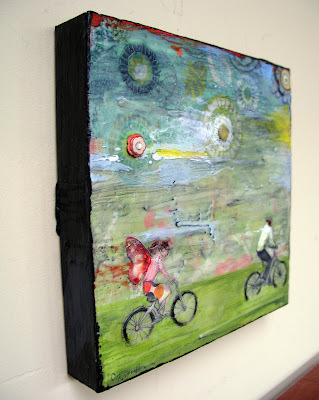 "You Are Wonderful" 6 x 6.5 inch beeswax encaustic & mixed media on wood. Original is SOLD, but prints are available here. Large-sized "LOVE" on the wall. Original is SOLD, but prints are coming soon to my Etsy shop. 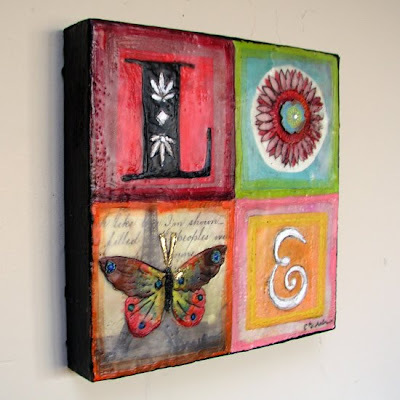 10x10 inch "LOVE" on cradled wood panel (front view). 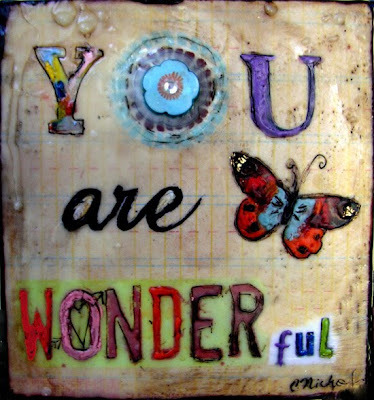 "You are Wonderful" would make a great Valentine's Day gift, but I think it's also perfect for Mother's Day -- this is mostly because it reminds me of my own mom & how we sometimes tell each other "you're wonderful.... no YOU're wonderful" and laugh. And, gosh, who doesn't like to be told they're wonderful? 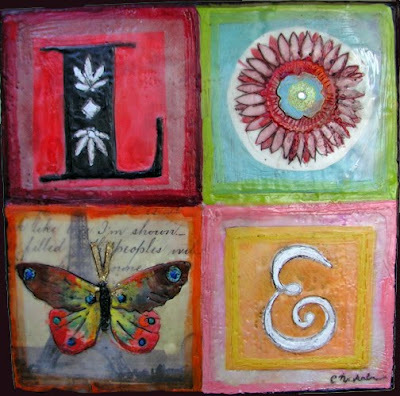 "House Built on Love" Original Encaustic Painting on Wood Panel 8x8 inches. Original is SOLD. 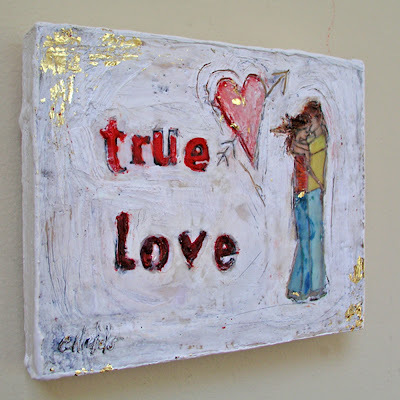 "True Love" Original Encaustic Painting on Wood Panel. Original is SOLD. I've recovered from the stomach flu and am back to work painting for my favorite holiday: Valentine's Day! 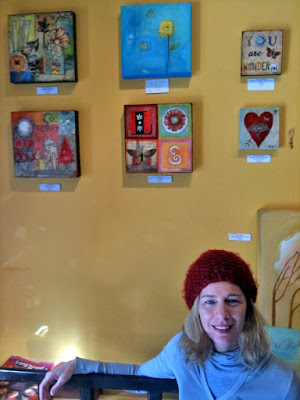 I finished these two over the weekend, and they are now hanging in Caffe Portofino (all of the others are sold! Yay!). 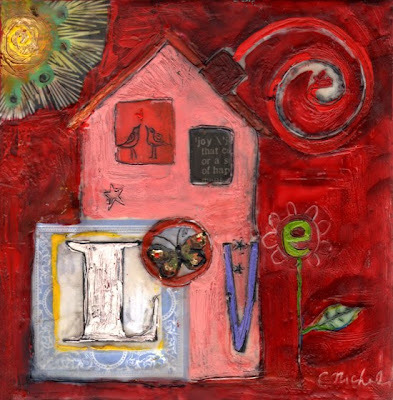 "House Built on Love" has a special place in my heart because it represents the ultimate importance of love in a home. Even if the world is crumbling around you (like it is for families in Haiti) or if these trying financial times are threatening your physical house, a "house built on love" is eternal.